In 2001, Russ Ervin, Steve Lovett, and Tim Miller set up folding desks and a coffee pot in the studio above Tim’s garage and started Ervin Lovett Miller. Now, as ELM approaches two decades in business with hundreds of successful projects and satisfied clients, our team remains energized by our commitment to create enduring value and enhance the quality of life through design. ELM has built upon Russ, Steve, and Tim’s original vision of an integrated, multidisciplinary firm with planning, architecture, and landscape architecture practiced together, essentially as a single discipline. This enables the firm to elevate potential solutions to a higher level and consistently create unique, inspired, technically-sound, high-performing, beautiful places. Our reputation of integrity, creativity, competence, and service has been earned over many years and through hundreds of successful designs. We don’t do projects--we build relationships that endure over time--just as our work is a legacy that must endure and bring sustaining value. Russ Ervin, Tim Miller and Steve Lovett in 2001, on ELM’s first day in business. 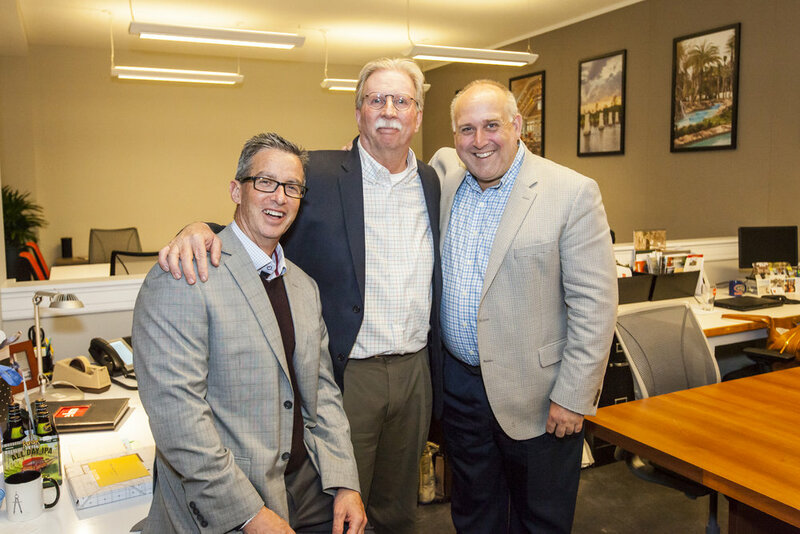 Russ Ervin, Tim Miller and Steve Lovett at Tim’s retirement celebration in 2018. Each project is unique, and we tailor our work to the specific circumstances of each project--large or small. By bringing multiple disciplines together, we approach projects thoroughly across various scales--from regional master plans, down to the most intricate of design details. We value the processes of collaboration, exploration, and discovery, and we listen closely to our clients’ goals, carefully studying the influences that define the places we work. We are inspired and energized by the active interaction with clients, partners, staff, and other consultants throughout a project’s lifetime. ELM’s small, open studio structure offers clients a team of talented, experienced designers and staff, with the added benefit of significant hands-on principal involvement and accessibility throughout all project phases. We have found that this smaller practice structure allows us to provide better service, build stronger relationships, and have more fun. We create exceptional results through innovative design, technical excellence, and superior service. Our extensive experience in the niches we work in allows us to intuitively know what works, what doesn’t work, and how to anticipate and avoid potential pitfalls for our clients. By remaining committed to understanding and achieving our clients' goals and vision, we deliver places of unique quality and enduring value.